Differential interference contrast image of the cyanobacterial culture from which chlorophyll f was isolated. Image from Science, courtesy of American Association for the Advancement of Science. (PhysOrg.com) -- University of Sydney scientists have stumbled upon the first new chlorophyll to be discovered in over 60 years and have published their findings in the international journal Science. Found by accident in stromatolites from Western Australia's Shark Bay, the new pigment named chlorophyll f can utilise lower light energy than any other known chlorophyll. The historic study published online in Science, challenges our understanding of the physical limits of photosynthesis - revealing that small-scale molecular changes to the structure of chlorophyll allows photosynthetic organisms to survive in almost any environment on Earth. The new chlorophyll was discovered deep within stromatolites - rock-like structures built by photosynthetic bacteria, called cyanobacteria - by lead author Dr Min Chen from the University of Sydney. A team of interdisciplinary scientists, including Dr Martin Schliep and Dr Zhengli Cai (University of Sydney); Associate Professor Robert Willows (Macquarie University); Professor Brett Neilan (University of New South Wales) and Professor Hugo Scheer (University of Munich), characterised the absorption properties and chemical structure of chlorophyll f, making it the fifth known type of chlorophyll molecule on Earth. Chlorophyll is the essential molecule in oxygenic photosynthesis - the process that enables plants, algae and some bacteria to convert carbon dioxide into sugar and oxygen by using free energy from sunlight. Until recently, oxygenic photosynthesis was thought only to occur in light that is visible to human eyes, between 400nm to 700nm, as chlorophyll was strictly limited to absorbing light in this range. This was overturned in 1996 when scientists found a cyanobacterium that could photosynthesise using light just outside the visible spectrum - at 710nm, in the infrared region - using a modified chlorophyll molecule, named chlorophyll d. Since this discovery, scientists around the world have been puzzled by how chlorophyll d is able to get enough energy from infrared light for photosynthesis. Now the rules of photosynthesis need to be rewritten again, with the discovery of a new chlorophyll that can absorb light of even lower photon energy - 720nm - making it the most red-shifted chlorophyll to date. In ecological terms, chlorophyll f allows cyanobacteria living deep within stromatolites to photosynthesise using low-energy infrared light, the only light able to penetrate into the structure, which challenges further our understanding of the physical limits of photosynthesis. Dr Chen, from the School of Biological Sciences, explains: "Finding the new chlorophyll was totally unexpected - it was one of those serendipitous moments of scientific discovery. "I was actually looking for chlorophyll d, which we knew could be found in cyanobacteria living in low light conditions. I thought that stromatolites would be a good place to look, since the bacteria in the middle of the structures don't get as much light as those on the edge." 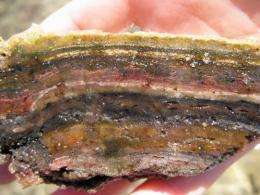 Cross section of a Shark Bay stromatolite. The layers are different microbial communities, each with very different physiologies. After obtaining a sample of stromatolite from Hamelin Pool, Dr Chen looked for chlorophyll d by culturing the cyanobacterial sample in infrared light of 720nm. 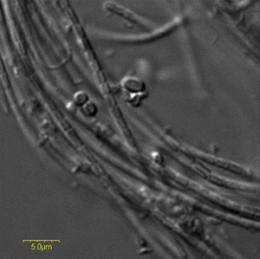 This ensured only the survival of cyanobacteria that had chlorophylls able to absorb and use infrared light. High performance liquid chromatography of the cultured sample performed six months later revealed not only trace amounts of chlorophyll d, but also a new chlorophyll not seen before. Testing the optical absorption spectrum of the new chlorophyll revealed that it could absorb much longer wavelengths of light than any other known chlorophyll - 10nm longer than chlorophyll d and more than 40nm longer than chlorophyll a.
Sequential mass spectral analysis revealed the molecular weight of the new pigment to be 906 mass units. Then nuclear magnetic resonance (NMR) spectroscopy was performed to determine the chemical structure of the chlorophyll. Results indicated that chlorophylls a, b, d and f have very similar chemical structures, differing only in the position of a substitution. Yet these tiny differences in structure give the chlorophylls very different spectral properties, and hence can function in very different light environments. "Discovering this new chlorophyll has completely overturned the traditional notion that photosynthesis needs high energy light," Dr Chen said. "It is amazing that this new molecule, with a simple change to its chemical structure, can absorb extremely low energy light. This means that photosynthetic organisms can utilise a much larger portion of the solar spectrum than we previously thought and that the efficiency of photosynthesis is much greater than we ever imagined. "Chlorophyll f, and its ability to absorb infrared light, can have numerous applications to industries like plant biotechnology and bioenergy. "For us, the next challenge is to work out the function of this new chlorophyll in photosynthesis. "Is its job to capture additional red light and pass it on to another chlorophyll, like chlorophyll a, in the reaction centre for photosynthesis? "Or is it the only chlorophyll responsible for photosynthesis in the cyanobacterium? And if it is, then we will be speechless wondering how this molecule can get enough energy from infrared light to make oxygen from water. "Whatever happens next, the fact that we have discovered a cyanobacterium that exploits a tiny modification in its chlorophyll molecule to photosynthesise in light that we cannot see, opens our mind to the seemingly limitless ways that organisms adapt to survive in their environment." All anyone that wants to dispute God created us needs to do is look at the really poor design of COMPLEX things like our eyes or spine instead of a simple molecule to know that we either weren't intelligently designed or God purposely DIDN'T create us in his image. You believers all wear rose colored glasses and believe what you want by selectively choosing facts to embrace and others to ignore. The human eye was designed to start falling apart after 45 years. The gel sac inside shrinks and pulls on the retina causing torn retina's. The lens gets cataracts and hardens so we can't focus properly and causes farsightedness. The human spine wasn't designed properly for standing up. Look at how many back problems people have. Worse yet our design seems to incorporate a mechanism for shrinking our brains. An article in a recent magazine has shown that our brain has shrunk in average size from 1500cc to 1350cc over just the past 20,000 years (and we aren't getting smarter). The reason our brains are shrinking isn't obvious to them but it is to me. The shrinking coincides with the rise of human society. Society has always promoted stupidity and modern society is the best at it that society has ever been. Do we teach people to value the opinions of smarter people or do we tell everyone that their opinion matters no matter how uneducated and dumb they are? Does everyone have an equal vote no matter their education? Are dumb people allowed to exploit smart people in a capitalistic society? Is stupidity a protected right by law? Our society is built on promoting stupidity, of course our brains are shrinking and it won't change until we teach dumb people that there are smart people and it's THEIR opinions that matter. Ravenrant...was that supposed to be an argument FOR evolution? I'm confused. FTR: I'm a proponent of evolution. Too bad you can't down vote someone lower than a one...would be nice to give some posts a -5. Especially when it is well known that cranial cavity size has little to no correlation with intelligence. Many seem to get stuck in the idee that evolution strives to make things better. Its really sexual evolution. The one who gets most surviving offspring makes the biggest changes. This makes defects like bad eyesight after 45-years of age a none issue. I can also see why humans don't need as big brain as earlier in history. Our societies protects us, and helps share information and solutions to problems. Surviving to make offspring is what counts. And if a mutation like being better to convert light to energy makes you more prosperous then other bacteria, it will continue to iterate in that direction. And Kev, one reason its so difficult to grasp evolution is that several billion years is a _really_ long timescale, and we as humans have problems grasping timescales much longer then our own lifespan. Kev thinks the world is only 6000 years old. Well said Inco. For anyone to argue evolution at this point of our scientific understanding is really.. well for lack of better words ignorant. We could never conceive the 200,000 years its taken neanderthals to mutate into the intelligent beings we are today. And to say we aren't getting smarter is absurd! look at life 50 years ago, look at life today and tell me our society isn't "smarter".. We are in the process of an evolutionary leap and our societies idiots are allowed to reproduce and bring down nature's own remedy of survival of the fittest. And instead of recognizing we are leaping forward, they turn to God for an explanation. If anything, science is proving more and more how obscene a thought god is. if there was a god, i doubt he could control the physics of the atoms in my fingernails let alone this entire universe. wake up people and smell the science. We could never conceive the 200,000 years its taken neanderthals to mutate into the intelligent beings we are today. And to say we aren't getting smarter is absurd! look at life 50 years ago, look at life today and tell me our society isn't "smarter".. We are in the process of an evolutionary leap and our societies idiots are allowed to reproduce and bring down nature's own remedy of survival of the fittest. Couple things here. Although I agree with your sentiment, your stance is horridly inaccurate. We did not evolve directly from homo neanderthalis. Modern man, as far back as we can identify ourselves as such, has maintained the same capability for rationale, this is also seen in the actions of other primate ancestors and offshoots. Being fitter, doesn't necessarily mean smarter. Don't confuse multigenerational knowledge collection for evolution, or at least not for physical evolution. Once again, natural selection solves the problem of adapting to a difficult environment. As usual, nature's solution is more elegant and practical than any paleolithic mythology. well being fitter 1000's a years ago when he had to hunt for food was an essential part of our evolution. We lost our body hair and our muscles are 1/2 the size they used to be because our evolution has allowed us to progress much farther than brute force. Evolutionary speaking, we have sacrificed our strength for intelligence. I do not doubt the fact that we are where we are today because of language and multigenerational knowledge, but our brains have allowed for such things to occur. This is a evolutionary step forward that allows us the ability to pass knowledge down and more importantly learn from it. Its almost a second form of evolution seeing how much its actually changed our civilization in just the past century. For one to deny that its a change in our brains wiring to obtain, pass along and prosper from prior learned knowledge is foolish and should go read news on msnbc's technology page instead. For one to deny that its a change in our brains wiring to obtain, pass along and prosper from prior learned knowledge is foolish and should go read news on msnbc's technology page instead. You're missing the point. "Man" had this ability prior to the evolution of homosapiens. Several other species show this as well. The technological development of language had little to do with physical evolution. Even the lowliest of primates around today is displaying the capability of using words, if not full bodied languages. I'd recommend you take a more honest look at what you hold to be true while you're watching that Nat Geo special on outdated things that the public might be able to swallow. Man DEVELOPED this ability. If man had had this ability, microprocessors would of been around for columbus to navigate the globe. Through the thousands of years of language and passing information to our children not JUST through genes has opened up our evolutionary tree to divert and allow the processing of such large bits of information, store it and make use of it an such a short time scale. Maybe if we took children from the pyramid days and grew them up in today's world there would be no difference, but take a child from the last ice age and they wouldn't have the brain power to keep up in todays world.. they would be "challenged". Man DEVELOPED this ability. If man had had this ability, microprocessors would of been around for columbus to navigate the globe. Because having a codified language means you will automatically understand Electromagnetic Physics? Maybe if we took children from the pyramid days and grew them up in today's world there would be no difference, but take a child from the last ice age and they wouldn't have the brain power to keep up in todays world..
Observations say you're wrong on that. Can your parents use a computer as well as you can? Mine can't, because they're entirely unfamiliar with computers. My great grandfather would call the Wright brothers out as morons by assuming they could have a heavier than air ship. Knowledge accumulates. If you have no basis for understanding something, chances are you won't understand technologies 5 steps beyond that either. and man's ability to accumulate knowledge, understand it and predict what the next 5 steps beyond that isnt an evolutionary leap forward? My father taught me how to build computers when I was 6 building 7Mhz PC Juniors, I am the guru I am because of him. My grandfather could of done it all too if he started when he was young and Im sure his father could as well. knowledge does accumulate, but our ability to process it is far greater than it was even several hundred years ago. and man's ability to accumulate knowledge, understand it and predict what the next 5 steps beyond that isnt an evolutionary leap forward? Straw man argument and no, no it isn't. We've had dreamers as far back as we've had language. Religion is one such dream. The dream of an answer to all questions. My father taught me how to build computers when I was 6 building 7Mhz PC Juniors, I am the guru I am because of him. My grandfather could of done it all too if he started when he was young and Im sure his father could as well. Exactly, but they didn't, why is that? Computers didn't exist, jsut as they didn't exist when Columbus sailed the ocean. If the species survives we're probably going to discover new physics about our universe. By your logic, you should already have technology based on that new physics, why don't you? knowledge does accumulate, but our ability to process it is far greater than it was even several hundred years ago. And that is entirely false. Top marks to Skeptic et al. for dealing with some of these posts. Could we possibly incorporate the newly discovered chlorophyll f into research/development of more efficient photovoltaics solar cells especially in higher latitudes of the earth? dealing with?? we are discussing on a science website, this is the actual process of learning fool so if you don't like it go somewhere else. Skeptic, lets guess in 100 years we will have the knowledge to fully reprogram our genome to be superhuman... we can fight every disease, no cancer, live 200 years and have eagle eyesite. Skip 10,000 years forward and when do we look at our evolutionary tree as the next step? and I bet that answer is in the 21st century! I dont have "advanced" physics but that doesnt mean I couldn't understand it, use it and predict things if I had access to the knowledge... and if I can't my grandson will be able to. Skeptic's right, joey, though I wish whoever was downrating your would stop, after all, it's not like you're talking crazy like marjon or kev or Jigga. All the evidence suggests that, so long as we confine ourselves to the species Homo sapiens, the most ancient members of our race were as mentally competent as are we ourselves. Some might argue moreso, after all, look at the pyramids and temples and such they built millenia ago without any kind of power tools. Think of it like running a relay race; the first guy's not gonna cross the finish line, but that doesn't mean he's not just as fast as the guy that does. I have read on this website maybe a year ago an article of a fish who is currently undergoing evolution because of a new predator that was introduced into its environment. was something like 60% of the fish population starting developing an exoskeleton or "armor", and its rapidly progressing all within like 50 years, I wish I could find it. I personally have access to any piece of knowledge man has at my fingertips with google and the internet. This is a tool my father didnt have, and my son is completely engulfed in. This ability alone to obtain knowledge this fast will have drastic effects on our brains wiring within the next few century (excluding genetic modifying a superbrain). We constantly evolve, every generation, we just haven't been able to monitor it until recently. My cereberal cortex will understand the physics of the universe than that of an egyptian, because thats whats important to humans at this point in time, 3000 years ago I'd be programed to move big rocks. I have read on this website maybe a year ago an article of a fish who is currently undergoing evolution because of a new predator that was introduced into its environment. was something like 60% of the fish population starting developing an exoskeleton or "armor", and its rapidly progressing all within like 50 years, I wish I could find it. There's a big difference here. How long is a generation for these fish? The shorter the life span, the faster natural selection works. That's the key here. Bacteria evolve new traits in days, sometimes in hours. Some more complex life forms in decades, humans in centuries and millenia. Keep in mind, the more complex an organism, the more easily a potentially beneficial side effect can have seriously negative rammifications. For example, autism shows greater interconnectedness of the brain for processing and solving problems, side effect: in most cases total social retardation, intestinal problems, and heart defects. The problem with your thinking, joey, is that there still exist some human cultures whose lifestyle has not significantly changed since the end of the last ice age, and who have been largely reproductively isolated from the rest of us, very remote tribal cultures and whatnot. Your theory would suggest that individuals born in those cultures could not be educated to understand the world as those of us from 'civilization' do, because their brains would not have evolved to enable such comprehension. I hope you can see how such a prediction follows from your idea. However, as I'm sure you're aware, no such educational barrier exists, thereby falsifying your theory. My own theory regarding autism is that a defect prevents the person from utilizing their brain to process social situations, and that excess processing power is turned to other problems instead. Id bet thats 50 generations worth if its like most fish population, but Im not sure to be honest. So 50 generations of humans takes.. if we use an average lifespan of 50 years (humans didnt live long until recently), is 2500 years. I wish we could read our genomes and compare that to an egyptian and computer model it to show which brain will process fast detailed information better. I dont doubt what your saying skeptic, all Im saying is people pass off our evolution as a knowledge passed down through generations, and as that is the cause, the effect is our brains adapting to accept this knowledge and process it for our better good. Autism could be us evolving, but not in the right way.. Remember to get it right it just might take a millennia. Maybe einstein had autism and it worked in a way that it didnt disable him but just connected his brain differently and WABAMM a whole new world of physics opened up (thats a step in evolution as far as Im concerned). You have a very valid point Thrasymachus about the remote tribes, but I would like to see a study to see if they are in fact wired differently than us. They should be more adept to survival off the land and not quantum gravity. There is probably a miniscule difference amongst our brains and if not id say its because it has only been recently that we have been exposed to this internet era or information. My great grandfathers lifestyle was probably extremely similar to his great grandfathers lifestyle, but my lifestyle is nothing they could of even imagined. You don't think in several generations this will have a profound effect on humans? Humanity's environment is undergoing HUGE changes, we are bound to change with it. Something worth noting is that we (modern humans) likely ARE wired different even from each other. I know that, for instance, when a human being learns a new skill their brain PHYSICALLY changes making a new neural pathway. In some sense what joey is saying might be true, but not really in the way he's stating it. Someone who's lived 40 years on the African Savannah might have more trouble learning Windows than someone who was raised in an industrial nation. Conversely one of "us" might have more difficulty learning to track and kill an animal from 50 yards with a primitive bow. It's important to note that these differences in brain wiring are NOT genetic, but more about environment and development. degojoey, seriously, much of what you have said is really racist. We have had people 100-200 years ago who lived like people 20.000 years ago, but whos children have been raised in an industrial country, and gone to school. They are no smarter or dumber then we are. So evolution dont work that fast on large complex organisms like we are. And that is because if some kinds of our cells mutate to fast, and mutate away 'programmable cell death', we get cancer. In bacteria and simpler cells, you see a lot of faster mutations due to the nature that enough will survive anyhow even if some gets deadly mutations. But thinking an egyptian for just 3k years ago wouldnt have managed our schools system if cloned now, then you are way off base. 3k years is next to nothing. Neanderthals had bigger brains then us, and we branched of well over 200.000 years ago from them. They mainly failed due to not trading/spreading ideas like us. Not because they were more stupid. Well this is a great point and plays into a related topic. I was hoping joe would stumble onto it before another did. Is it any wonder why asians raised with the I Ching have an easier time understanding Quantum mechanics than someone like myself who was raised with aristolian philosophy as the backdrop? In reality, no, not in the least. People living today have different skill-sets than those living thousands of years ago, and their brain wiring will show commensurate differences, as pointed out before. However, those differences result from life experiences, not from underlying biology. An native infant born in an isolated tribal community, if raised in a modern environment, would not only have indistinguishable mental abilities to anyone else in the same modern environment, but their brains would also be wired differently to his or her tribal cousins. "I just love how God's creations continue to amaze us." Don't be silly; the fact that there are many different chlorophylls with many different ligt-utilising capabilities is fully to be expect in an evolutionary framework of natural selection acting upon variant types of chlorophyll. Now this God you mention; who is he? what is he? where is he? how does he do-it? is he? Some of the commentors above have confused a few different things. We have evolved to make use of knowledge passed down from our parents and we have hands that can use tools and brain hand co-ordination. These things have been inherited for about 50,000 years or more. As one of the comments above stated survival of the fittest means simply that if you live long enough to breed you may pass on your genetic traits. IF you have a genetic disposition to idiocy and you breed then by evolutionary standards you are fit. Even if you personally manage to lower the global average I.Q of mankind. Our skills with launching satellites and playing Nintendo games do not make mankind in general smarter than someone living of frogs caught in a rain forest. In fact it may take better spatial co-ordination to survive in some extreme environments that it does in your average urban environment. So are we still evolving? yes we are and things influencing this will be soft food diets means that we will have more and more chinless wonders in our future. More unhealthy people surviving with medical assistance means more unhealthy genes passed on. Until the not so distant future arrives where people will be able to have medical assistance in removing unwanted genetic traits. Then evolution will change direction again.